• One good turn deserves another, meaning, you then need to find 11 other bloggers with less than 200 followers who you think are deserving of the award so that you can then nominate them! In other words, keep the love going and help small, new blogs get out there and get noticed! • Finally, the award presenter will ask 11 questions of you which you need to answer and then you, in turn, ask your nominees 11 questions, and so it goes. So, first of all I need to give you all 11 facts about myself. I apologise if I’ve told you any of these things before, but after 5 years of blogging it’s hard to remember what I haven’t said! I almost studied Russian at university, but ended up not getting in because my grades weren’t good enough. The uni that did let me in didn’t offer Russian, so I did International Relations instead. On my mum’s side of the family, I am the oldest of 18 grandchildren. There was one cousin who was older than me, but she died before I was born. On my dad’s side of the family, I only have one first cousin! She was born in December 2012 and she lives in Australia, so I’ve only ever seen photos of her. Most of my dad’s cousins (my cousins once removed) are actually closer to my age than his though. I am the only one of my siblings who has a name that doesn’t exist in Germany (even with a different pronunciation). I find this ironic seeings as I am also the only one who lives abroad. The first book that ever made me cry was Black Beauty. My favourite crisps are the kind that are meant to appeal to kids, like Monster Munch and Wotsits. I also love Frazzles. I love my job, but the thought of spending the next 40-ish years of my life doing nothing but work (with the occasional holiday in between) makes me want to cry. When I was about 10, I begged my mum for months to let me become a vegetarian. When it got to Christmas, I changed my mind. Christmas without pigs in blankets isn’t a real Christmas! I used to be able to quote the film The Lion King word for word… thanks to my brother who was obsessed with it and watched it multiple times every day! I can still quote quite a lot of it. Eating ice cream in the middle of winter while sitting in front of the radiator, wrapped in a blanket. I only do this when the boyfriend is away! Definitely dogs! 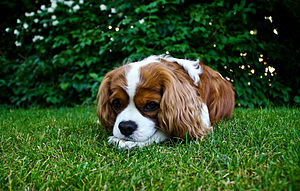 If I didn’t live where I do, I would love a little white Westie or a Beagle or a Cavalier King Charles Spaniel. There are a few individual cats I like, but for the most part I think they’re evil and probably plotting to take over the world… only the lack of opposable thumbs has stopped them until now. Most embarrassing. Ooh, difficult! I’m always doing embarrassing things. Seriously, I can embarrass myself just by opening my mouth. Hmm, the one I can think of right now happened when I was 17. I was invited to my friend’s birthday party… at a pub. My other friend had brought along a bottle of vodka, so we spent most of the night buying coke then topping up with her booze, until she ran out. Then we started ordering triple vodka and cokes. I was supposed to take the last bus home, but completely forgot about it. Then, an hour after it had left, I went into the toilets, sat down on the floor in front of the sinks (I couldn’t make it any further) and threw up all over myself. I was literally metres from the cubicles! Then my friend had to call my dad to come and pick me up because I couldn’t remember my own phone number. My dad just laughed at me all the way home, but the friend whose birthday it was didn’t speak to me for about three months… he worked at the pub and when the owner found out my age he came close to getting fired. Oops! What do you call a chav in a locked filing cabinet? Do you prefer the city or the country? I don’t like big cities, but I wouldn’t want to live right out in the country either. I like Karlsruhe because it has the best of both worlds – it’s a city so there’s plenty going on, but it’s nor a huge city and the atmosphere is more like in a small town. Also, the countryside is close enough to visit. At work, a translator who is proofreading for me. Privately, Jan on Tuesday. Would you rather have feet sized ears or ear sized feet? Feet sized ears. I could hang loads of earrings from them and turn them into a fashion statement… ear-sized feet would make walking too difficult! Would you rather be attacked by a dozen duck sized horses or one horse sized duck? 1. If you could change your first name to anything at all, what would you pick? 3. What is your favourite quote? 4. Tea, coffee or hot chocolate? 5. If you could own any animal, what would it be? 7. Who is your favourite author? 8. What is your favourite flavour of crisps (chips for the Americans)? 9. Apart from blogs, which website do you spend most time on? 10. Do you have a talent? If so, what? 11. What was the last song you listened to?